ATHOL -- Adversity affects people in different ways. Some are unable or unwilling to deal with it. Others choose to face it head-on, with inner strength and a determination to turn a negative into a positive. Erik and Heather (Kimball) Plotkin, formerly of town, are among the latter. Over the past two and half years, the young couple, now living in Shirley, has had to confront and deal with the fact their son Tyler, 2 1/2, has epilepsy. His condition resulted from a severe brain malformation. Tyler was diagnosed at three weeks old. In October 2005, at only 16 months old, he underwent surgery at Children's Hospital-Boston and had the entire right half of his brain removed to eliminate the grand-mal seizures he was experiencing on a daily basis. A special diet and medicines prescribed were not enough to control his seizures. "He was having 30 to 40 grand grand-mal seizures on average per day," said Erik, 32, a software programmer and the son of Richard and Pauline Plotkin of Athol. "The medicines essentially kept him out of the hospital," said Heather, 28, a graphics and Web designer and now stay-at-home mom. 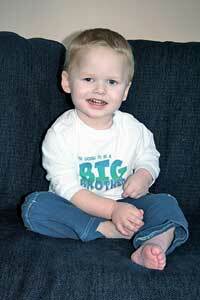 The longest Tyler went without experiencing any seizures was a 36-hour period in 2004. It was from Christmas Eve morning to Christmas night. The couple describe it as their Christmas miracle. Following surgery, Tyler was diagnosed with hemimegalencephaly, a condition resulting in a spinal fluid build-up in the right cranial cavity. To address the condition, a shunt had to be implanted in the right side of Tyler's skull to drain the fluid. It is something he will have to live with the rest of his life. Without it, he could suffer more seizures or even death because of the fluid build-up. The shunt malfunctioned twice and had to be replaced each time. "We have to be proactive to make sure there is no malfunction," Erik said of the shunt. Upon release from Children's Hospital, Tyler endured a lengthy stay at Spaulding Rehabilitation in Boston before finally returning home. Almost from the moment of their son's diagnosis, the Plotkins benefited from a close, supportive network of friends and family, which came together to help them in whatever ways needed. Meals were cooked for the young parents, who spent the majority of their time at their son's side. When he entered Spaulding Rehabilitation, a high school friend of Erik's offered him a place to stay at his home in Somerville to cut down on travel. Aside from the help of family and friends, the Plotkins had insurance to cover their medical expenses and the costs of needed therapeutic equipment. The experience, however, made the couple realize that other families with children affected by epilepsy might not be as fortunate. This led them to establishing the Tyler Foundation, the purpose of which is to help to financially support families of children with a brain malformation resulting in seizures that are being treated at either Children's Hospital or UMASS Medical Center in Worcester. Tyler was admitted to both during his ordeal. "We have spent several days, weeks and months in the hospital over the past two years," the Plotkins write on the foundation's Web site: www.tylerfoundation.org. "Through that time, we have been privileged to meet so many sweet kids who have similar issues, or sadly worse. These kids are the strongest kids we have ever seen. They have been through so much, and continue to do it with a smile on their faces." * Provide meals at a hospital or rehab facility to families of children who are inpatients at either hospital. * Provide gas cards to be used by families who are transporting children to doctor's appointments and hospital visits related to epilepsy. * Provide financial assistance for the purchase of therapeutic equipment used in the treatment of children suffering from the delayed development caused by the brain malformation and seizures. In order to fulfill its mission, the foundation relies on the assistance of donors, sponsors and volunteers. In addition, fundraisers are also held. To date, $8,000 has been raised. The Plotkins said recently the first $25,000 will be used to establish an extraordinary needs fund at Children's Hospital. One fundraiser will be a Dean's Beans (of Orange) coffee tasting scheduled for Saturday, April 7, from 9:30 to 11:30 a.m., at 202 Entertainment Inc. on Daniel Shays Highway in Orange. Heather is the daughter of 202 owners Kathy and Kenny White, and Dennis Kimball of Orange. Tickets are $5 for adults and $1 for kids 12 and under. Those under 2 are admitted free. Tickets can be purchased at the door, at 202 Restaurant, or via e-mail at tylerfoundation@yahoo.com. Those attending will have the opportunity to sample eight different flavors of coffee and an organic hot chocolate. Proceeds from orders placed will benefit the foundation's mission. Monetary donations will also be accepted. The foundation is a non-profit, tax exempt entity; all donations are tax deductible. Another fundraiser will be a golfing skills event on Saturday, March 31, at the Chip Shots Grill and Sports Pub in Littleton. The cost is $20 and includes free appetizers and entry into the longest drive and closest-to-the-pin contests. There are a limited number of slots. A blood drive for Children's Hospital is scheduled for Saturday, May 19, at 202 Driving Range inOrange. An appointment is required. There is no charge. His surgery has left Tyler with limited left side motor skills, and he attends physical therapy several times a week to improve them. He is undergoing occupational therapy, speech therapy, hippotherapy and acupuncture as well. His peripheral vision is also affected. Despite the affects of the surgery, Tyler is making progress and is beginning to take his first steps. "He's definitely made some big strides in the past 15 months," said Heather, who is pregnant with the couple's second child, a girl. Another positive is the fact Tyler's doctors do not believe his mental capacity will be affected. "They believe he should be able to catch up," said Erik, who added some children who have had the same surgery have gone on to graduate high school with honors and attended college. Of the establishment of the foundation, Erik said, "We've been lucky, and we're giving back." Since the surgery Tyler has had no more seizures, and he's essentially been given a whole new life to live, as the Plotkins write on their Web site. They add, "He is a remarkable little kid, and 'one tough cookie.'" Those who would like to make a donation or who would like more information on the foundation can contact the Plotkins at tylerfoundation@yahoo.com. Donations can also be mailed to Tyler Foundation, P.O. Box 733, Groton, Mass., 01450.